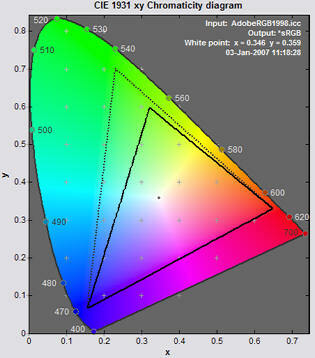 There is a significant difference between a printer's total (maximum) gamut and the achievable gamut when printing from a working color space. With Gamutvision you can display both and compare them side-by-side. You can also compare the gamuts available from different working color spaces. using it as an output profile (3 or 4) with the rendering intent set to None, in which case the mapped RGB output is the same as the input. This broader picture of Gamutvision's structure illustrates the display possibilities. You can select up to four ICC profiles: two input profiles and two output profiles. Input profiles: The gamut patterns interpreted according to the input profile (1 or 3) are transformed directly to the device-independent space (L*a*b*, xy, or uv) used for diaplay. The full gamut of the device or color space represented by the input profile is always displayed. Output profiles: The gamut pattern is mapped from the input profile (1 or 2) to the corresponding output profile (3 or 4) according to the selected rendering intent, then transformed to the device-independent space for display. No gamut mapping takes place (RGB values are unchanged and the full gamut is displayed) if Rendering intent is set to None. Enter a printer profile into Profile 1. The profile 1 display will contain the total gamut. Enter a working color space profile into Profile 3 and the (same) printer profile into profile 4. The gamut actually achieved (with rendering intent 3→4) is displayed as Profile 4. Display Profiles 1 and 4 simultaneously using Display A or Display B. This is shown below. The display is 3D L*a*b* (wire input, solid output). Top view has been pressed. ( Last view is shown in its place.) so the a*b* gamut is displayed. Results are shown below. The gamut volumes are displayed on the lower-right of the image. The volumes are 820,376 for the unmapped profile and 692,225 for the profile mapped from Adobe RGB. For clarity, the background color has been set to 0.2 using the More button. Clicking Z-Out enlarged the gamut image from its normal (small) size. You can also enlarge the gamut image by clicking More, then selecting a value for 3D plot axis setting other than the default vis3d. Although the image will be larger, the a*b* axes may not display properly. You can view input and corresponding output gamuts simultaneously. You can view any two gamuts simultaneously using Displays A and B. You can switch between views for rapid comparisons. For example, to compare the effects of two working color spaces with a single printer/profile combination, you would enter the two working color space profiles into input Profiles 1 and 3 and the same printer profile into output Profiles 2 and 4. You could then view profiles 1 and 2 or 3 and 4 (showing the effects of the gamut mapping), or you could use Display boxes A or B (shown above) to compare the output gamuts in profiles 2 and 4. 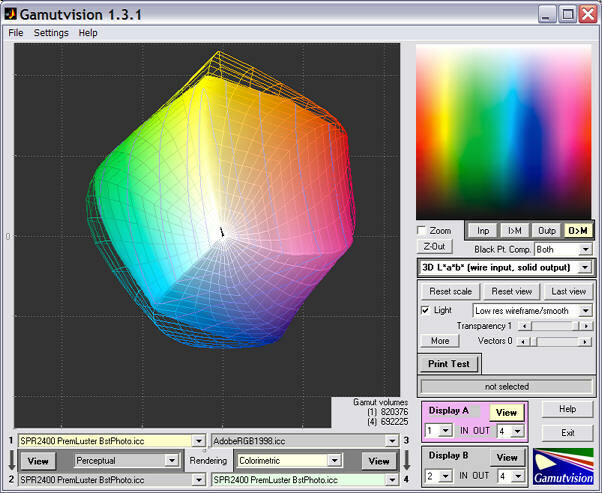 The gamuts for Epson R2400 Premium Luster prints made from Adobe RGB (1998) (wireframe) and sRGB (solid) working color spaces are shown on the right, using the 3D L*a*b* display set to Top view. The gamut volumes are 698,960 and 562,168, respectively; the volume is 24% larger when mapped from Adobe RGB. (Displays on this page use Epson-supplied X-rite "premium" profiles, released around October 2005; different from earlier profiles supplied with the R2400). To see the entire gamut of a printer profile you should always use the 3D L*a*b* view, set for Top view. You should never use the 2D a*b* Saturation view, which works well for color space profiles or mapped printer profiles, but does not work well when a printer profile is used as an input profile or an output profile with Rendering set to None. 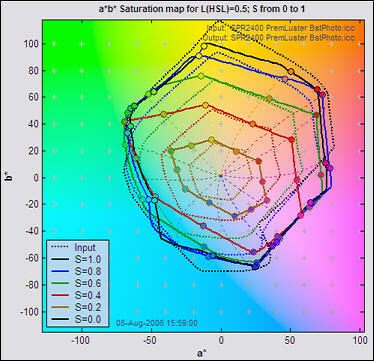 The reason: The 2D a*b* Saturation map is based on a gamut image where L(HSL) = 0.5. (This is L in the HSL color representation, not L*.) 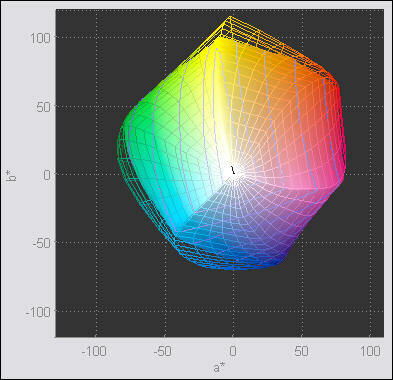 In normal color spaces, colors have their maximum saturation where L(HSL) = 0.5. But printers are highly nonlinear devices: they don't necessarily reach maximum saturation at for L(HSL) = 0.5; hence the 2D a*b* saturation map can produce the strange result shown on the left, which is not the true device gamut. 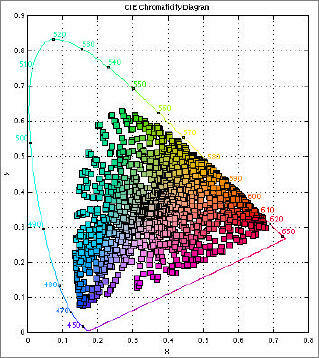 In the presentation Metrics for Comparison of Color Encodings (CIE TC8-05) by Kevin Spaulding and Gus Braun of Kodak, available online from colour.org, the authors have created a CIE xy diagram representing the full range of colors available from reflective surfaces. They used a wide variety of sources (graphic arts spot colors, etc.) to assemble this diagram (slide 5 in the presentation). 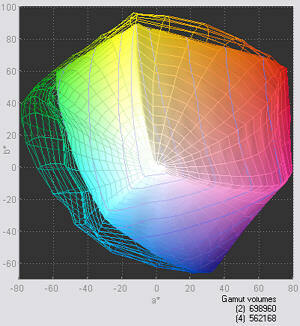 It is instructive to compare their results to the two best known color spaces, sRGB and Adobe RGB (1998). Although the eye can see more highly chromatic colors than these (represented by the outer horseshoe), they are extremely rare in nature. The best examples are the vibrant colors of a prism in the sun and some rare irridescent butterflies— colors that can't be reproduced by standard output devices (monitors or printers). Adobe RGB (1998) encompasses most of the reflective colors; only a few reds and cyans are out of gamut, and not by much. The eye is not extremely sensitive to chroma differences in highly saturated colors. So Adobe RGB is a safe, conservative choice for a working color space. sRGB is clearly weaker in greens and cyans. It's the standard color space of Windows and the internet— by far the most convenient, foolproof choice , but Adobe RGB is preferred when the intended output is high quality inkjet prints. The reader is cautioned that the CIE 1931 xy chromaticity diagram has several well-known limitations. The space occupied by the greens is exaggerated, and the 2D representation has no information on the lightest or darkest colors.